Lindeth Howe HotelA warm welcome awaits you at Lindeth Howe, a property once owned by Beatrix Potter. 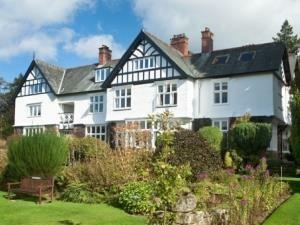 Set in 6 acres of beautiful grounds, with stunning views over lake Windermere and to the fells beyond. The hotel boasts beautiful bedrooms, cosy lounges, log fires, a well stocked bar, a 2 AA rosette awarded restaurant with a delicious seasonal menu to suit all tastes and a treatment room for that extra bit of luxury. It's peaceful location means residents are able to relax in the gardens or in the library and lounges enjoying afternoon tea or browsing through many books, guides and leaflets on the area as well as information on Beatrix Potter herself. For the more active, Lindeth Howe can arrange tee times at the local golf course, provide fishing permits, organise sightseeing tours by the Mountain Goat mini coach company, advise you on a range of walks or anything else you might be interested in. For whatever the reason that brings you to the Lake District, Lindeth Howe will create the perfect atmosphere and make it an enjoyable and memorable stay. Minimum age for children in restaurant 7yrs, high teas for under 7s, sightseeing tours available. Children welcome from any age. Lindeth Howe sometimes limits bookings to 3 or more days. All rooms are en suite with bath, shower and heated towel rail and include hospitality tray, satellite TV & radio, telephone, internet connection, hairdryer, trouser press, ironing facilities, toiletries & bathrobes Tassimo coffee machine. Twin rooms can be requested subject to availability. All Dinners prebooked with accommodation will attract a 15% discount. Please note this offer is not applicable if you are booking the 2 night Mountain Goat package. From the south and east: M6 jct 36 takes A591 towards Windermere, at large roundabout takes first left B5284 signposted Hawkshead via Ferry and Crook, along this road for 6 miles past Windermere golf club on left to junction of A5074 staggered cross roads. Straight across, left and then sharp right, is Longtail Hill. Lindeth Howe is first drive on left 150m down the hill. From Scotland and the North East: M6 jct 40 take A66 towards Keswick. Take either A592 via Ullswater and Kirkstone Pass to Windermere or continue along A66 to Threlkeld, turn left through St.Johns in the Vale to Windermere on the A591 via Grasmere and Ambleside. At the junction of the A591 and A592 head south to Bowness Bay on the A592. Continue south out of Bowness on the A592 towards Newby Bridge & Barrow after 0.75 mile there is a left fork BS5284 Longtail Hill. Lindeth Howe is the last drive on the right 300m up the hill. By rail, bus or plane: The nearest station is Windermere 2.5 miles from the hotel and the main West Coast line station is Oxenholme 10 miles from the hotel. There is a National Express coach stop at Windermere Station. Airports: Manchester 90 miles, Leeds Bradford 75 miles & Newcastle 120 miles. Taxi pickups can be arranged from any of the stations or airports at a charge and booked via the hotel. If you use public transport to get to the Lake District then car hire, bike hire or escorted trips can be arranged through the hotel. Check-in time took longer than expected. Was told check-in was at 3pm but ended up waiting more than 30min after 3pm. More pro-activeness could be exercised to inform guest that room was ready instead of having guest to check and ask repeatedly. Room door was open when checking in. Seems hastily cleaned. But generally, service was alright though expectations were higher having seen past reviews. Have to commend the restaurant staff though. Food and service were excellent. Thank you for taking the time to leave us a review, we will certainly look in to the points you raised with the team, we hope to see you again very soon. Separate entrance for wheelchair uses adjacent to main front door.